Across the country you can find bridges that have a deep connection to their surrounding communities. Some carry a certain mystique because of their secluded locations. While another may come with an old ghost story of a sorrowful spirit waiting eternally for a loved one who will never return. At a certain time and in a certain light, you might be able see this phantom person…waiting. 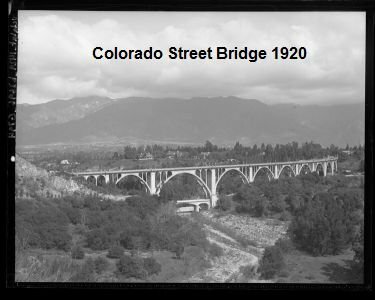 The Colorado Street Bridge in Pasadena, California has another rather unique story to tell. Not too long after its completion in 1913, the structure began to take on the name of “Suicide Bridge” because of the countless jumpers that flocked to its almost 1500-foot span in its early years. During the Depression of the 1930’s, the bridge became a solution for those down on the luck, depressed or unable to weather the economic storm that so many were facing at that time. It is rumored that over a hundred people decided to end their lives during this period. That number may be a bit skewed considering the city of Pasadena was desperate to keep the news of the suicides on the hush. After all, downtown Pasadena was becoming a popular hangout for the wealthy and those looking for action. The downtown area sported fancy hotels, dance clubs and ritzy bars. It wasn’t looking for a black eye near their main source of revenue. The bridge sat less than a mile down the street. So how could there NOT be ghosts and lingering spirits one could ask. Recent numbers put the total number of jumpers around 200. That number has to be extremely low considering people are still finding their way to the bridge and jumping despite the high guardrail installed for just that reason. The actual number could be as high as a thousand if one were to do enough research. It’s no surprise there are claims of seeing elegantly dressed men in early 1900’s attire walking its span. There is also a legend of the construction worker who fell to his death into the concrete as it was being built. Story says it was too hard to dig him out of the drying foundation and left him there hoping to keep it secret providing another possible source of paranormal activity. There are even reports of everything from ghostly Native Americans to horse and buggies on top of the bridge and below it. My team has picked up EVPs of children and names of team members at the bottom of the bridge. Several years ago, a person I was investigating with recorded some very clear voices of young boys with slightly English accents and a woman saying sorry in a very soft voice. Very eerie considering the EVPs were captured in the same location so many fallen bodies have ended up. 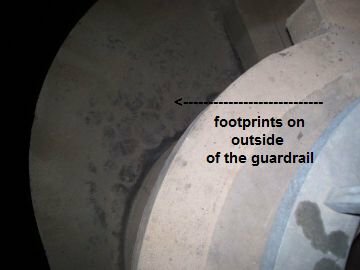 A few months ago I took a picture of footprints on the OUTSIDE of the guardrail on the bridge structure. It dawned on me I was possibly looking at the final steps of a desperate soul contemplating if or when they were going to jump 150 feet down to the floor below. In recent years, there have documentaries made and short stories written about the bridge’s history. A few years ago, Peter James, a well-known local medium, shot a documentary video that can be found on Youtube along with others centered around the bridge’s history and its connection to the paranormal. In his opinion, there were numerous wandering spirits walking across its length at that moment. There was also a documentary filmed several years ago dedicated solely to the paranormal activity on and around the bridge. It was distributed in short supply but very informative for those interested in this ghostly landmark’s paranormal history. Suicide Bridge in Pasadena may not be as old as some you could find in the Northeast corner of the United States. It won’t have as beautiful a story attached to it as many others elsewhere. But one would be hard pressed to match the sad history and paranormal activity the Colorado Street Bridge brings to the table. It still holds a vintage charm but with its haunted history, it has become a hotspot for avid ghost hunters, photographers and the many observers wanting to possibly catch a glimpse of the spirits who decided to make this bridge their final walk in life.